Why should you choose to play in the World of Greyhawk setting? Greyhawk establishes its theme and tone, largely based on six important factors. Below is a real quick primer to explain these key areas in order to give you a broad idea what the setting has to offer you as a dungeon master or player. After reading this feel free to explore the other links on the homepage for more focused information on the World of Greyhawk setting. Enjoy! Maps: The first thing you'll notice about Greyhawk is the maps are works of art. Darlene created the first maps, given a hexagon overlay. They are vibrant in color and evoke the style of hand drawn explorer maps. These maps are simple, elegant and full of potential for development by DMs. The original maps are two part, poster sized and encompass the eastern half of a continent called Oerik on the planet Oerth. Then what do we mean by the World of Greyhawk? The Free City of Greyhawk is the largest city on the map and is the central hub for all knowledge, intrigue, and adventure in the setting. It's through the lens of Greyhawk that we view or play out the events unfolding in the world. History & War: The World of Greyhawk has a backdrop of ancient history and ongoing war. The perfect comparison for this in today's pop culture is the Game of Thrones series. East Oerik was once populated by peaceful Flannae nomads, elves, dwarves and their like. Wars in Western Oerik and a pair of twin cataclysms forced Suel and Oerid migrants eastward where after centuries of colonization, nation building and more wars, resulted in the current political landscape. To further lend to the medieval fantasy feel, Greyhawk is home to many noble Houses and Knighthoods such as the orders of the Hart, Holy Shielding and the Watch.There is several main regions of Greyhawk (such as the Great Kingdom, the Sheldomar Valley or the Empire of Iuz) and all are constantly on the edge of some conflict with one another. 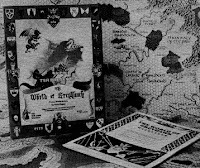 The biggest and most recent of these wars is introduced in the Greyhawk Wars boxed set, taking place about 10 years after the original Greyhawk timeline. Depending on your DM this war is optional, because there is unlimited directions you can take these stories, or depending on your DM's campaign they can be ignored entirely! I stress again, the history and backdrop is for flavor and is not always required to have memorable adventures in Greyhawk. Magic: Greyhawk by virtue of its age and being based on Gary Gygax's home campaign, is the origin of hundreds of notable D&D spells, magic items, artifacts and more. Whether you play 1st Edition or 5th Edition, you will immediately be immersed in a Greyhawk campaign once you cast a Tenser's Floating Disk or equip your ranger with a Quiver of Ehlonna. Despite comparisons, Greyhawk is a high magic world (posing as a low magic one). It is quite full of wizards, sorcerers and warlocks like Mordenkainen's Circle of Eight, the Silent Ones of Keoland or the Guild of Wizardry in the City of Greyhawk, and of course evil spellcasters in the service of Iuz the Evil. The World of Greyhawk is full of ancient buried empires, tombs of brooding liches and more, all with magic yet to be discovered by adventurers. Deities: Clerics and paladin players will rejoice at the abundant lists of deities for the World of Greyhawk. These pantheons are divided into a few cultural pools, the Suloise, Oeridian, Flannae and Baklunish gods. Just like gods of our mythologies, Greyhawk has a deity for just about everything if you're inclined. These pantheons have mixed over the centuries however, so now the more interesting and commonly known ones are focused on. Do a quick perusal through any D&D book, and you will find references to great Greyhawk deities that cover every character alignment option, like Pelor the sun god, Wee Jas the goddess of death and magic, Nerull the reaper, Heironeous the god of justice and his evil brother Hextor god of war. Evil, Good and the Balance: Thematically, the World of Greyhawk is a struggle of balance between good and evil with some NPCs just trying to play both sides. Evil is always ascendant in this setting. Liches (Acererak), cultists, witches (Iggwilv) or plain bandits are a constant here. When one villain falls, there always seems to be another ready to rise. Iuz is the undoubtedly greatest of these villains; a despotic demigod in the flesh, ruling over an empire of orcs, undead and demons. When you hear of Iuz just think of Sauron and the land of Mordor from Lord of the Rings. Up against such odds, adventurers are often thrust into the role of heroes for the cause of Good especially paladins and clerics of good gods like St Cuthbert, but this is by no means the only option. Greyhawk is literally gray in its tone. Characters can easily be amoral and content looting dungeons and raiding towers, enriching and empowering themselves without heed to the bigger picture. Iconic Adventures: And lastly, Greyhawk is best known for its adventure modules. By now, what D&D player hasn't heard of the Tomb of Horrors, Against the Giants or the Temple of Elemental Evil? Searching dungeons, ruins and caverns is a way of life in this setting. The ruins of Castle Greyhawk, Maure Castle or the Temple of Elemental Evil are mega-dungeons that can occupy a characters entire career. Many other modules require great treks being set in remote jungles, icy mountains, deep swamps or far below in the Underdark. Check the link and you'll see a comprehensive catalog of Greyhawk modules, sourcebooks and so on. Take your pick; every character level, theme and environment imaginable is here.